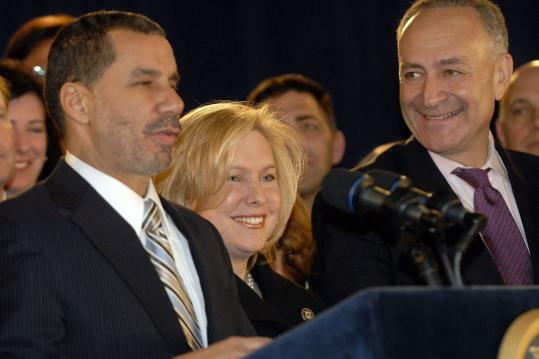 ALBANY, N.Y. - Governor David Paterson yesterday appointed Democratic US Representative Kirsten Gillibrand to fill New York's vacant Senate seat, finally settling on a woman from a largely rural, eastern district of the state to replace Hillary Clinton. "For many in New York state, this is the first time you've heard my name and you don't know much about me," Gillibrand said at a ceremony in Albany. "Over the next two years, you will get to know me. And, more importantly, I will get to know you." The appointment, which requires no further confirmation, came one day after Caroline Kennedy, daughter of President John F. Kennedy, abruptly withdrew from consideration. Gillibrand, 42, has been considered one of the top contenders in Paterson's selection process, along with Kennedy and state Attorney General Andrew Cuomo. Gillibrand had served as Cuomo's special counsel when he was housing secretary under President Clinton and she worked on Clinton's first Senate campaign in 2000. Paying tribute to her predecessor, Gillibrand said: "I can't tell you how many times she has personally inspired me to action." The appointment lasts until 2010, when a special election will be held to fill the final two years of Clinton's term. Clinton gave up the seat to become President Obama's secretary of state. Both Clinton and Obama offered praise and congratulations to Gillibrand, who graduated from Dartmouth College in 1988 before getting her law degree from UCLA. Clinton called her "an intelligent and dedicated public servant and a dear friend." In his statement, Obama called Gillibrand "a strong voice for transparency and reform in government" who has the "integrity, character, and dedication to public service to help us achieve our greatest goals." But Representative Carolyn McCarthy, who wasn't among the 10 to 20 people Paterson said applied for the Senate appointment, immediately criticized the expected pick. The Democratic congresswoman, whose husband was killed and son wounded by a gunman on the Long Island Railroad in 1993, said Gillibrand's support of more conservative issues such as gun ownership rights was out of step with most New York Democrats. McCarthy, 65, vowed to challenge Gillibrand herself in next year's primary or find a younger candidate to do so. "I will certainly raise my voice and run if no one comes forward," McCarthy said. "Believe me, this is a personal issue for me. I don't think someone with a 100 percent NRA rating should be the next senator from New York." During the news conference, Gillibrand complimented all of the state's female House delegation and offered an olive branch to McCarthy, who she said has "provided outstanding leadership in fighting against gun violence and keeping our children safe. I pledge to work with her on her signature bill for updating background checks to keep guns out of the hands of criminals."